We had been to The Cupping Room Café once before – for breakfast. And while we had very simple fare on that visit (bagels, muffins, and a honey bun the size of the moon), it was good, the service efficient and pleasant, and the atmosphere exceptional. So this year we decided to give The Cupping Room a try at lunch. A minute on the atmosphere of The Cupping Room – it’s like you want your living room to be. Warm and cozy yellow walls, beautiful flowers, and unique art, warm wooden tables, and a friendly staff that brings you what you ask for. The weather was horrendous – pouring rain. You know that feeling – finding a haven in a storm. And on top of that – a haven with really good food. When possible I try to order signature dishes at restaurants, then taste other items on the menu. So I had to try The Cupping Room Sandwich – grilled carrots (carrots on a sandwich? – a first for me! 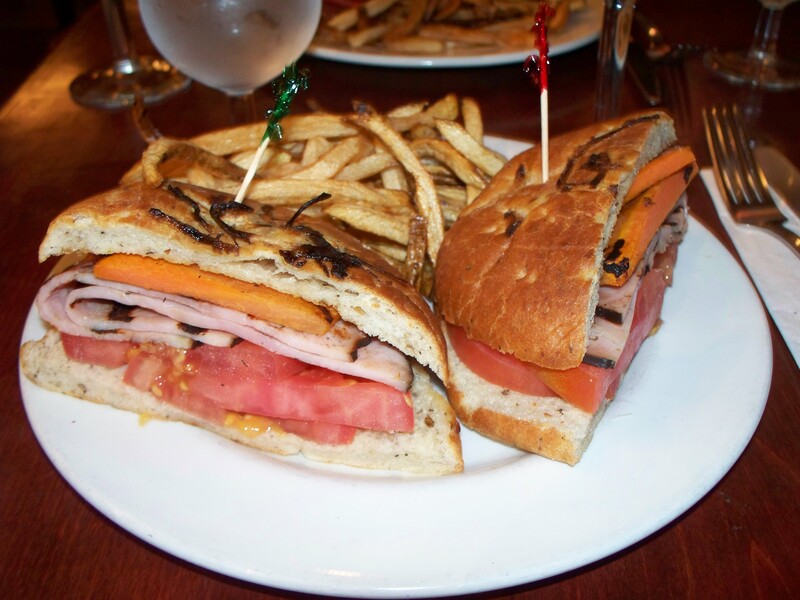 ), grilled plum tomatoes, roasted red peppers, and grilled smoked ham on an onion roll spread with a grainy mustard. Of, course a side order of fries was required. I love grilled vegetables and they were delicious paired with the smokiness of the ham. The fries were thin, crispy, hot and yummy with the perfect amount of salt on them. Some restaurants tend to over-salt French fries. These were perfect. A crisp sauvignon blanc was just the right accompaniment. There’s nothing particularly complicated about this sandwich. Any of us could make it at home – the key is quality ingredients. We’ve already decided that next year we’re heading to The Cupping Room for dinner – it will be our first dining hat-trick (to borrow my soccer-playing nephew’s lingo). I’ll keep you posted.